A couple of weeks ago, I reported that the parties involved in the Google Book Settlement had applied for an extension of the deadline for authors to file claims for cash payments for works scanned by Google without permission. A couple of other deadlines are unchanged: to remove your works from Google's Participating Libraries and Research Corpus databases, you must make a request on or before April 5, 2011. To remove your works from Google Books, you must make a request on or before March 9, 2012. The Google Book Settlement--what's it all about? Several years ago, Google entered into agreements with a number of libraries to scan the books in their collections, creating a vast database now called Google Books. The books were listed online, along with publishing info and, for books still in copyright, limited "snippets" of text (for public domain books, the entire text was available). Claiming the scanning was fair use, Google argued that it didn't need to seek copyright holders' permission. Authors disagreed, and in 2005, a group of publishers and the Authors Guild filed suit to stop the scanning. In October 2008, the parties in the suit reached a settlement that didn't address the copyright question at issue, but did give Google the green light on digitization--and on monetization of its database--in return for payments to authors whose in-copyright works had been scanned without permission. As a result of challenges, including objections from the US Justice Dept, the Settlement was amended in November 2009. A Fairness Hearing was held in February 2010, at which the presiding judge, Denny Chin, had a chance to hear statements of challenge and support. A final decision on the Settlement is still pending. I thought the Settlement was approved. Nope. The Settlement is still under consideration and is not final. There's no guarantee it will be approved, or if approved, that it will remain in its current form. Who's covered by the Settlement? All holders of a US copyright interest whose books were published on or before January 5, 2009. The Settlement defines this as any books that were either registered with the US Copyright Office or published in the UK, Canada, or Australia as of that date. Books published after January 5 are not part of the Settlement. I'm not a US author. Does the Settlement affect me? Possibly, if you hold a US copyright interest (a copyright protected by US law). If you're a German author who sold US rights, for instance, you may be affected. What's the cash payment? The cash payment is money Google has agreed to pay for in-copyright works digitized without permission on or before May 5, 2009. (Note the wiggle room between the Settlement cutoff date and the digitization date, allowing Google plenty of time to digitize books published by the cutoff date--just one of the many concessions by the Authors Guild that granted Google privileges far beyond those it originally claimed when it began scanning.) The payment for books is $60. What's the Claim form? It's an online process available at the Book Settlement website. You can start here. You can also download a paper form if you don't want to make your claim electronically. Damn. I didn't opt out, and I don't want my works to be included in Google's databases. Is there anything I can do? Yes. You can direct Google to remove or exclude your works by filling out the Claim form. To remove your works from Google Books, you must fill out the Claim form on or before March 9, 2012. To remove your works from the databases of participating libraries and from the Research Corpus, you must fill out the Claim form on or before April 5, 2011. Be aware that if you direct Google to remove your works, you may not be able to reconsider and get them back in again. If the Settlement isn't approved yet, why do I need to do anything? It's entirely possible that the Court may instruct the parties to amend the Settlement again, in which case all the deadlines will change (again). Or the Settlement may be struck down, in which case there will be no deadlines. As of now, though, nothing can be assumed--which means that even though the Settlement hasn't been approved, you need to proceed as if it had been, including complying with deadlines. What about Google's new eBookstore? How's that related to the Settlement and to Google Books? Google Books is the giant digital book database that Google created in part by unauthorized scanning, and also by negotiating permissions with publishers and authors. Google's eBookstore, rolled out with great fanfare at the end of 2010, is a separate commercial enterprise. It's where Google sells digital versions of that portion of the Google Books database it currently has the right to sell--including public domain works, works where permission has been granted by the author, and works where permission has been granted by the publisher. The books covered by the Settlement are not currently being sold in the eBookstore. Google doesn't yet have the right to do that. But if the Settlement is approved, they will be. The legalese is making my head spin. This whole Google thing is such a hassle, and anyway, I'm busy. What if I just ignore it? That's always an option. And believe me, I sympathize. I didn't ask Google to scan my books, and I also didn't ask the Authors Guild to include me by default in this enormous, complicated Settlement that is engineered largely to Google's benefit, and obliges me not just to fill out forms and pay attention to deadlines, but to compose these lengthy blog posts. But like it or not, if you're a US copyright holder with works published on or before a certain date, and you haven't opted out, you are part of the Settlement--even though you never asked to be. If you ignore the Settlement, it won't go away--but what will go away are your options for controlling how a giant corporation to which you never granted any permissions makes use of your intellectual property. There are a number of decisions you can make as to how, or whether, Google uses your works. The only wrong decision is to do nothing. Word of Borders' financial difficulties has been circulating for months, and there's been widespread speculation that the chain would fail. The end came over the past few weeks, as Borders began delaying payments to creditors (it reportedly owes publishers and vendors more than $260 million, with the Big Five publishers topping the list at $25 to $41 million each), and its attempts to round up new financing crumbled. Whether it can restructure and emerge as a stand-alone company is unclear. Many Wall Street bankers and lawyers who have studied the chain believe it may not be able to avoid liquidation. It is expected to report more than $1 billion in liabilities in its bankruptcy petition, said a person familiar with the matter. The bad news doesn't end there. Australia's REDGroup Retail, which owns Borders Australia, the Angus & Robertson book chain, and Whitcoulls, New Zealand's major book chain, also failed this week, amid charges of financial ineptitude and lack of bookselling expertise. Debts are reported to be in the $150-$170 million range. REDGroup's collapse is unrelated to the Borders US failure--the Australian Borders stores were spun off and sold some time ago--but it's still an ominous sign. It has sent shockwaves through the publishing world down under, and has infuriated consumers, whose gift vouchers are only being honored if the consumer matches them dollar for dollar. In Canada, the nation's largest book distributor, H.B. Fenn, has also begun bankruptcy proceedings--a move that was apparently a surprise to publishers on both sides of the border. Again, debts are said to be in the millions. What does it all mean--for writers, for customers, for books, for publishing? There's plenty of speculation--John Scalzi has some thoughts on the impact of the Borders closing on authors, and BackSpace founder Karen Dionne and Teleread's Jason Davis examine some of the possible implications for book publishing, especially print. However, as always with major events of this sort, no one can really say for sure. All that can be known right now is that it's a sad day for the book business, and especially for the many people whose jobs will disappear along with those closing stores. This just in from the Authors Guild. My bolding. Authors, publishers and Google have filed a stipulation asking the Court to extend the deadline for filing claims to receive an upfront payment -- a "Cash Payment" -- in the Google Book Search settlement. The current deadline under the settlement, which is being reviewed by the court, is March 31, 2011. If the extension is granted, authors and publishers will have until one year after the Court approves the settlement to make a claim for a Cash Payment. If you are not claiming a Cash Payment, you may file at any time. Follow the filing instructions here: Google Book Search Claims. Guest Blog Post: Book Review -- "The Street-Smart Writer"
Today, author Marian Perera reviews a book I often recommend for writers who are interested in learning the basics of self-protection in the shark-infested waters of writing and publishing: The Street-Smart Writer, by prolific author Jenna Glatzer and publishing attorney Daniel Steven. When writers are curious or concerned about literary scams, they can check out websites and discussion boards, of which there are several – such as Writer Beware and Preditors and Editors. Or they can pick up one book: The Street-Smart Writer, by Jenna Glatzer and Daniel Steven. Subtitled “Self-Defense Against Sharks and Scams in the Writing World”, this book is both a good introduction to and a comprehensive overview of just how many ways writers can be taken – not only by outright scammers, but by well-intentioned people who nevertheless lack relevant experience or resources. It was released in 2005 but is just as timely today, with one exception that I’ll mention later. The book touches on all types of literary scams, from agents to screenwriting to contests, but it also goes into detail to show how scammers profit even if they charge nothing upfront or only want small payments. These modest sums can slip under the radar. But a ten here and a twenty there can add up to thousands of dollars, depending on how many writers fall for it. I also enjoyed the deconstruction of scammers’ claims, some of which may well be true. For instance, a scam agent may say, “Hey, I’m sending your work to Random House today!” Sure, could be true, but it means nothing — you could send your work to Random House, too. Doesn’t mean it’ll get read, doesn’t mean anyone’s shown interest, doesn’t mean a darn thing. My favorite, though, was the writer who created a fake contest where, for a five-dollar entrance fee, contestants would be sent a chapter to edit. There was a modest grand prize for the winner – and major potential savings for the writer, who was hoping to have her entire book edited that way. From five dollars, to the five million that Edit Ink raked in, scams come in many forms and sizes. The Street-Smart Writer is informative and blunt, but also fair – for instance, it describes when and how self-publishing can work for writers. With plenty of examples and suggestions that can be followed up on, it’s helpful for writers in any field, whether they’re entering short stories in contests, querying agents, or checking out CreateSpace. Most important, though, it advocates a mindset of caution and healthy skepticism, encouraging writers not to be either rushed or intimidated into anything. Information on what to avoid is balanced out with advice on what to do – subscribe to Publishers Weekly, check agents’ track records, assess contracts. Every aspect of writing and publishing – conferences, contests, seminars and e-zines – is mentioned if not evaluated. I especially liked the part on blacklisting, whether this threat is made by a legitimate person or by a scammer when writers speak out about their experiences. Finally, there’s an entire chapter on the legalities of the business, from plagiarism to parody, and an appendix of forms that includes a sample literary agent’s contract, film option agreement, publisher’s contract, and so on, to give writers a basis of comparison. The only vanity presses not mentioned are those that are branches of legitimate publishers, such as Harlequin’s DellArte Press and Thomas Nelson’s West Bow Press – but these are relatively recent developments that post-date the book's publication. The Street-Smart Writer is helpful, meticulous, upbeat (despite the horror stories), and a good way to render most scam sharks toothless. Marian Perera studies medical laboratory technology (final year of college!) when she isn’t writing. Her first novel, a romantic steampunk fantasy called Before the Storm, was just released in paperback. She blogs about writing, publication and every step between the two at Flights of Fantasy. One of the important negotiation points for life-of-copyright publishing contracts is including provisions in the termination clause that oblige the publisher to take the work out of print when sales or royalties drop below a minimum level. Why is that important? Well, when your book has fallen so far into the backlist that your publisher no longer even includes it in its catalogs, and sales have dropped down to practically nothing, there's no reason for the publisher to continue to hold your rights. Much better for the book to go out of print, and for you to revert the rights and do something else with them--self-publish as an ebook, for instance, to take advantage of the exploding ebook market, or try to market them to other publishers. 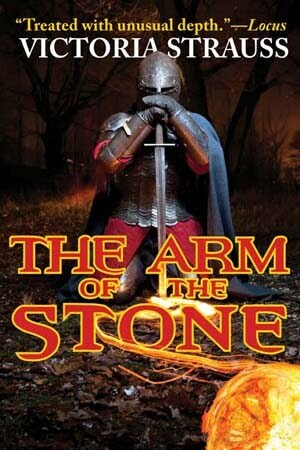 That's what I did with my Stone duology (The Arm of the Stone, first pubbed by Eos in 1998, and The Garden of the Stone, first pubbed by Eos in 1999)--and I'm thrilled to announce that both novels have been bought by Phoenix Pick, a small publisher that specializes in re-issuing previously published books by established science fiction and fantasy authors. The books will have brand-new cover art, and will be available as trade paperbacks and as ebooks. Arm has just been released, and is available at Amazon, among others. To celebrate, I'm giving away three signed copies. To be entered in a random drawing, please email me at victoria [at] victoriastrauss.com with your name and mailing address, and "February Contest" in the subject line (your info won't be shared, and you won't be added to any mailing lists). All entries must be received by midnight, February 28, 2011. US and Canadian residents only, please! Garden will be released next month, and I'll be posting another giveaway then. For ebook enthusiasts, the publisher will be giving away free downloads as soon as both books are available. I'll post an announcement then. Please feel free to post this giveaway on Twitter, Facebook, etc., or to feature it on your own blog. Thanks! Oprah. The mere mention of her name sets writers' (and let's face it, publishers') hearts aflutter. Oprah, maker of best sellers. Oprah, whose most offhand endorsement can generate massive sales. What author hasn't daydreamed about that kind of exposure? What author hasn't wondered how their life would change if their book became an Oprah pick? Well, other than Jonathan Franzen. So I'm betting that legions of poets are thrilled by this call for submissions at Oprah's website. Poetry—it has the power to excite, encourage, and even sustain us during difficult times. How has poetry made an impact on your life? O, The Oprah Magazine is teaming up with guest editor Maria Shriver for our poetry-themed April issue, which hits newsstands March 15. Send us your original work or a favorite poem that's especially meaningful to you—Maria will review submissions, and some may appear in the magazine or on Oprah.com this spring. Sound tempting? Not so fast. There's a problem: the Terms and Conditions for original submissions, a.k.a. the fine print, to which you consent in full simply by sending in a poem. These appear (in very fine print indeed) below the entry form. According to Item 2, poets won't be paid. "Neither Harpo [Oprah's company] nor any of its affiliated companies or entities are obligated to use or pay you for any Submission." (My bolding.) For many poets, perhaps, not such a big deal--I'm sure plenty of people will be willing to pass up money in order to be able to add Oprah's magazine to their publication credits. But that's not all. Again, my bolding. 4. All Submissions shall become the property of Harpo, may be edited for length, clarity and/or functionality, will not be subject to any obligation of confidentiality, may be shared with and used by the staff of Harpo and any of their affiliated companies or entities and shared with legal authorities if Harpo believes it warranted. Neither Harpo nor any party with whom Harpo shares the Submissions shall be liable for any use or disclosure of any information or Submission that you submit. 5. Harpo shall exclusively own all known or later existing rights to the Submissions worldwide with the unrestricted right to use the Submissions for any purpose in all media now known or hereafter discovered without compensation to the provider of such Submissions. - Simply by submitting your poem, you grant Oprah's company and anyone in or affiliated with it the right to use or disclose your submission and any information accompanying it, without limit. - Simply by submitting your poem, you grant Oprah's company all rights to your entry, exclusively and worldwide, presumably for the full term of copyright. Recently, a lot of anger was stirred up in the writing community over a contest launched by new publisher First One Publishing, which featured very similar rights grabs. Will any of that outrage be directed Oprah's way? It will be interesting to see. Just another reason to read the fine print. Many of you may already be familiar with the names in the title of this post. If you're not, have a look at this Alert on the Writer Beware website, and at my September 2009 post about the Florida Attorney General's civil lawsuit against Fletcher, his companies, and some of his business associates for deceptive business practices. For those of you wondering about the status of the lawsuit, it's still active, and proceeding through the courts. Lawsuits of this kind often progress very slowly, especially where defendants seek to delay the process by filing jurisdictional disputes, motions for changes in venue, and the like. We will be posting updates as we receive them. EDITED MAY 2014 TO ADD: The lawsuit has been settled, with Strategic and Fletcher ordered to pay restitution to authors. A full report is here.